Onigirazu is a spin-off of the traditional Japanese rice ball, onigiri. If you’ve been to Japan or Japanese grocery stores, you have most likely seen or eaten those little nori packages. What I love about onigirazu is how you can stuff lots more filling inside to make them into proper meals. 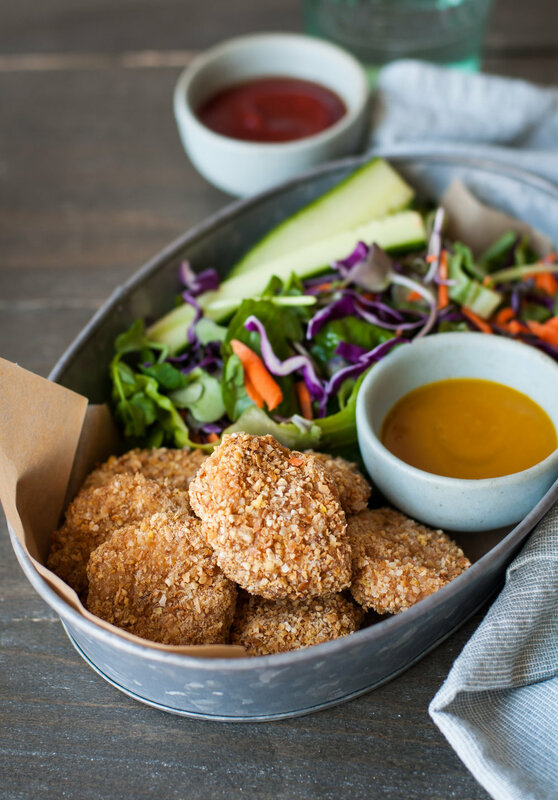 Filling wise, these are as versatile as any sandwich. We’ve been on a major canned tuna kick lately ever since we discovered Aubrie, who is allergic to fish, can eat canned tuna without any issues. Feel free to change up your veggies but I am very partial to purple cabbage, some sort of leafy green and definitely, definitely do not skip the kimchi. Well unless your kimchi is hella spicy than you might omit if making this for children. Other fillings we enjoy include egg (hardboiled or scrambled), avocado, marinaded firm tofu, julienned carrots, sautéed mushrooms, sautéed spinach, grilled meats (leftovers), and ohhhh my gosh I’m getting hungry for one right now but it’s 10pm! The plastic wrap at the end helps to hold the sandwich in place while the warm rice softens and shapes the nori to hold everything in place. After a minute or so, you can remove the it and the same piece of plastic over and over until you’ve assembled them all. These little rice sandwiches are well-loved by both my husband and I, as well as our two girls. I always prep extra ingredients to pack school lunches for them the next day as well (read my tips under the “Make In Advance” section below). Besides loving to eat them, the girls always get a kick out of showing these off in the lunch room at school because it always draws curiosity and comments from classmates and teachers! All the filing components (i.e. tuna, cucumber, shredded purple cabbage, etc) and the rice itself can all be prepared in advance. However, you are best to assemble as close to eating as possible as the heat from the fresh rice softens the nori/seaweed over time. But I have prepared them in the mornings for my daughters’ school lunches and my own lunch which is about 4 hours between assembly time to consumption, and the nori has held up perfectly fine. When doing this, reheat the rice (I use the microwave) and allow it to cool slightly before filling the nori. Recipe makes 6 onigirazu / rice sandwiches. Have fun changing up the fillings too! Cook the rice as you normally do. Soggy, wet rice is seriously THE worst but especially so in this. I make rice in my Instant Pot pressure cooked on high for 4 minutes with natural release. For cooking any white rice (short or long grain), the magic ratio of water to well-drained rice grains is 1:1. For this application, I even err on the side of a trickle less water to ensure the rice is not soggy. This ratio works for Instant Pot pressure cook, electric rice cooker and stove top (assuming a tight lid on the pot). Once rice is done, fluff it with a rice paddle or large spoon and season with some salt. Keep cooked rice warm (but not piping hot) by draping a clean kitchen towel over the pot, until ready to assemble. Put the well-drained tuna into a bowl. Add the vegenaise or mayonnaise plus salt and pepper to taste. To assemble, lay a square piece of plastic wrap on the table (this helps form the onigirazu a little bit easier at the end). Place a sheet of nori on top. Spread about 1/3 cup of warm cooked rice evenly into a square shape, with the square rotated 45 degrees vis a vis the nori. Leave enough room around all sides so the nori corners can be folded in to cover the filling later. Meaning, the corners of the rice square points toward the middle of the straight lines of the nori. Like a diamond within a square? If this makes little sense, have a look at the step-by-step images above. Continue layering on the fillings: tuna mixture, julienned cucumber, shredded purple cabbage, shredded lettuce, kimchi and sesame seeds. 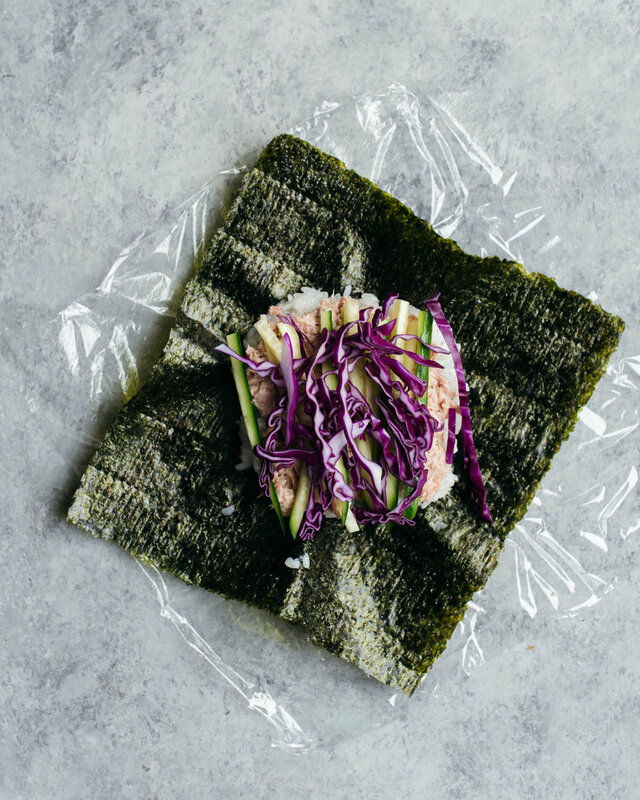 Be mindful of the amount of filling you pile on, that you will need to fold the nori corners up with the tiniest bit of overlap (the rice itself helps everything stick together) to seal the fillings. So resist the inclination to overstuff! Fold up corners of the nori to fully enclose the filling. Then fold up the corners of the plastic wrap firmly around the formed onigirazu. Let it rest for a minute. The heat from the rice gently softens and molds the nori so the sandwich stays in place. Unwrap, cut in half if you desire, and enjoy!